The former Force India team is set for an official name change before the start of next season but is currently entered under the holding name of Racing Point. While a name may be confirmed before that date, the team is set to unveil its 2019 identity and livery at the Canadian International AutoShow in Toronto. With the launch date occurring five days before the start of pre-season testing in Barcelona, the car itself is unlikely to be the actual design that will run during testing for logistical reasons, with development and assembly of the launch car occurring right up until February 18. The Canadian International AutoShow itself takes place from February 15-24 at the Metro Toronto Convention Centre. 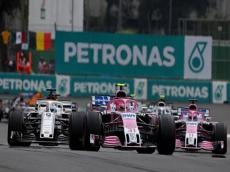 The launch location comes following the takeover of the team by a consortium led by Lawrence Stroll in August, with the Canadian’s son Lance joining Sergio Perez to drive for Racing Point in 2019. As well as the Force India date, Ferrari team principal Maurizio Arrivabene has said his team is aiming to unveil its 2019 car on February 15.